AYHA is very interested in growing the sport of hockey in our community. Hockey not only helps build well-rounded healthy kids, it also builds our community. In July before each season, AYHA purchases 30 sets of new kids sized hockey equipment which you can use for the season which are ideal "starter kits" for kids and parents to avoid the cost of buying equipment. 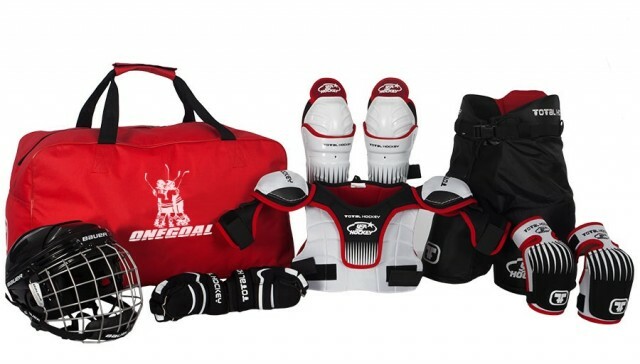 The starter kit covers your child from helmet to shin guards and comes in a nice carrying bag (excluding skates & stick). You just need to buy a new or used stick and skates to get your child started. AYHA offers this to any member who can fit into the equipment, which are generally ages 4 to 8 years of age. AYHA has been very successful with this program as we currently have 60+ members already utilizing this equipment. The equipment can be used for the whole season or until you purchase your own equipment. The program was created to give kids the opportunity to get into the sport of hockey at a low cost. Note that AYHA also provides each child with a jersey and matching hockey socks to complete the equipment needed to play. A sample "small" Onegoal starter kit is shown in the image. You must register as a member for the current season before you purchase a starter kit. Purchase your starter kit from AYHA's online store. Purchase price is $90, which is fully refundable in the form of an account credit when the kit is returned. Instructions will be provided after purchase for picking up the equipment bag. If you have questions about the equipment program please contact registration@adkhockey.com.